Posted by sneaks in display topics, DVDs, great ideas, problem solving. We like this idea, also spotted at the Miller Branch of the Howard County Public Library, for a bunch of reasons. Shelving G and PG-rated films separate from the PG-13 and R-rated titles makes parents and caregivers more comfortable about perusing the shelf with their children: they don’t have to worry that a movie with a provocative or scary cover is going to leap out at the toddler and scare him or her. Plus, movies that appear to be kid-oriented but which in fact are rather intense for younger viewers, such as Transformers and Spider-man, are rated PG-13, so they aren’t in this section. No more arguments about the superhero movies. 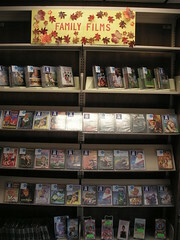 And lastly: the librarians at the Miller Branch say that they can’t keep this display stocked fast enough! Their DVD circs improved measurably after separating the Family Films from the, er, Adult Films.